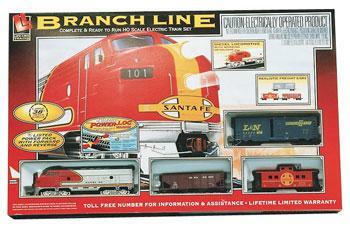 This is an Diesel Freight Branch Line Santa Fe Model Train Set HO Scale from Life-Like Trains. Retail $84.99 SAVE 24% ! Also includes Life-Likes Power-Loc track, the unique side-locking track system that clicks together instantly and locks track securely in place. There's no need for rail joiners, so set-up is quick and easy. Solid roadbed base offers durability and support on any surface (even carpet), eliminating the need for boards, nails, screws or tools. Sets also include a UL-listed power pack with forward and reverse, and a terminal rerailer. Set includes F7 diesel locomotive with working headlight, two-bay hopper, steel door box car, eight-wheel caboose, 38" Power-Loc track circle, illustrated instructions and a copy of "Beginner's Guide To Model Railroading."